Editor’s Note: These articles first appear in the Napoleon Association’s Journal #9 – 12 in 1989. Following defeat of Austria at Austerlitz in December 1805, Napoleon remade the map of the German States previously known as the Roman Empire to create a Confederation of the Rhine. At the same time the Batavian Republic was made into a kingdom with his brother Louis as its ruler. With the escalation of the hostilities in Spain during 1808, Napoleon naturally looked to this new source of manpower to swell the ranks of the divisions being sent into the Peninsula. Rather than being spread around the divisions piecemeal like some other regiments, the Germans and Dutch were brigaded together under General Leval in the 4th Corps. 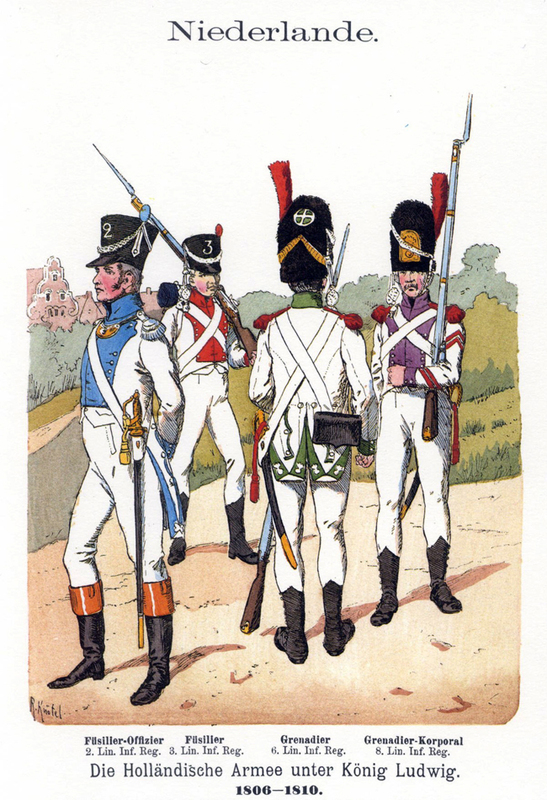 The Herbert Knŏtel images are from Greenhill Books Napoleonic Uniforms and are used with the permission of the publisher. The Richard Knŏtel images are from the Tony Broughton Collection.